Covered in soft white icing and hand finished with a classic black and white ribbon. 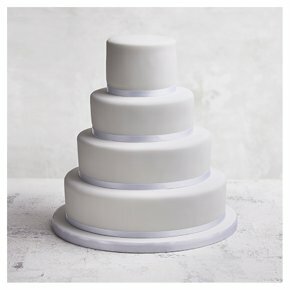 This stylish cake is available in six options. Remove ribbons before serving. Filling Choice: Consists of 4 tiers of golden sponge wedding cake with raspberry jam and vanilla buttercream.